The 12th edition of India’s flagship automobile show, Auto Expo 2014 has attracted an impressive 5.61 lakh people that was held at Auto Expo Mart in Greater Noida. The once in two years Auto Expo started on February 5th and ended on February 11th, 2014 that attracted 90k people on the last day. The week long auto expo unveiled 90 new models of which 26 are global models. The glamour quotient added further boost to the show as Sachin Tendulkar gave his appearance on the first day for BMW. The other celebrities present at this year’s auto show was led by Bollywood superstars Priyanka Chopra, brought in by Jaguar, Kareena Kapoor at DC Design, John Abraham at Yamaha, Akshay Kumar at HMSI and Ranbir Kapoor at Hero MotoCorp. The promotion for autoexpo 2014 has been done in a big way. One of the mediums used for promotions is Twitter. A lot of tweets poured in by the visitors and auto enthusiasts that have a great value when they get mined. 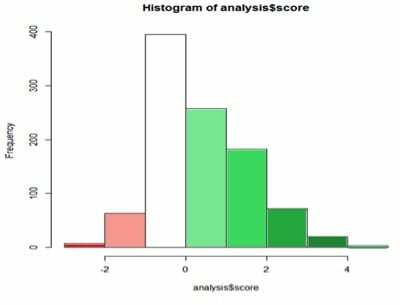 The statistical tool used in the analysis in 2, 3 and 4 procedures (see below) is ‘R’. The promotion started with name of the twitter handle @AutoExpo2014. The handler started trending the show with hashtags such as #AutoExpo2014 and #THEMOTORSHOW. The hashtag #AutoExpo2014 has got extensive response but very less for the hashtag #THEMOTORSHOW. This is because THEMOTORSHOW is a very generic name and year is not mentioned. The tweeples could not associate the hash tag with the current edition of the auto expo. But, the hashtag #AutoExpo2014 has been the trend throughout the week. The official twitter account@AutoExpo2014 has been able to attract above 3000 followers and posted about 2000 tweets. It has followed 300 accounts which include most auto companies and celebrities like Sachin Tendulkar, Akshay Kumar so that they would retweet to their followers. Takeaways – The event, trend, or show should be easily identified with the hashtag. All capital letters for the hashtag is not advisable. The initial effort should be in making the people follow the official twitter account of the event by following the celebrities and auto companies who have lot of fans. The next effort should be focussed on engagement by posting different pictures of cars, initiating people to tweet about the event and cars. A word cloud has been formed to find out what attracted the visitors most. Word cloud is a way to show words, where the most important ones are bigger than the others. The font size of the word increases with the increase in the frequency of the word used by the tweeples. A word cloud can also be used by the companies to identify the potential keywords for the right investment in AdWords. It can be used to find what the people perceive about the brand or company and to find out how the people associate their company, which helps in positioning. 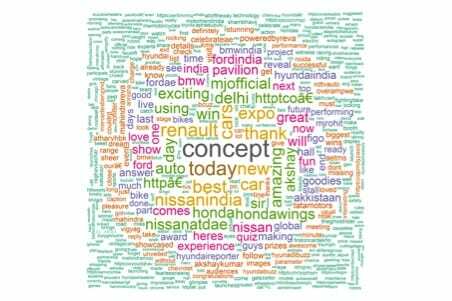 Here is the word cloud that has been created by extracting some of the tweets with the hashtag #AutoExpo2014. Also Read Does AMD’s Radeon VII Launch Indicate An AI-Compute Market Divide? The word “Concept” has been mentioned most number of times in the tweets that were extracted. That means the concept cars have attracted the visitors the most during the auto expo. A concept vehicle is a car that is made to showcase new styling and/or new technology. They are exhibited at the auto shows to find out the customer opinion on the model and new designs that may or may not be mass-produced. The auto companies that are mostly mentioned in the tweets are Renault, Nissan, Honda, BMW, Hyundai, ford, TATA pavilion when compared to other companies. The word ‘Goodies’ is also mentioned in some tweets which refer to the fight by the reporters for the goodies like pen, pen drive that were distributed by the companies. These small incidents also get noted and get posted by the tweeples. ‘Akshay’ and ‘akshaykumar’ are also mentioned which reveals that he created a buzz among the celebrities. Words used to describe the cars or the event, are ‘best’, ‘experience’, ‘exciting’, ‘amazing’, ‘performance’. These words can be used in positioning/promotions/ advertisements as these words are chosen by visitors to describe the cars or show. Note that price is not mentioned in the tweets which indicated the visitors are not interested in. Most of the auto companies used their own hashtags to promote their brands. Here is a look at the hashtags used by 3 of the companies Ford, Honda and BMW. Ford and BMW have used the hashtags with AE2014 which explained its presence in AutoExpo2014. All the three companies have used hashtags to promote their brands like FordSamvad, HondaCity, and BMWi8. Honda has used the hashtag #HondaCitygives26kmpl to focus on functionality as a fuel efficient car. Sentiment analysis explains the mood or opinion of the tweeples about a brand/topic/event. It can be a positive or negative value. A positive mean value represents a positive response by the people who tweeted. A negative mean value represents a negative response from the people. A zero mean value represents a neutral response. High positive value means that they words used are highly positive like excellent, exciting, and amazing. Highly negative value means that the words used worst, boring etc. The above histogram shows that most tweets have the positive words in their tweets. The mean value is 0.85 and median is 1. This shows that the mood of auto expo tweeples is positive. Overall the twitter mining helps the companies know about the opinion of the people about the company/brand. The above methods mentioned can be applied on the comments that were received from users. A lot of text is collected through feedbacks, user opinions on social media sites, e-commerce sites, offline methods that bring in a lot of value if it is mined. Rahul Billapati is currently pursuing PGDM-Marketing in IMT-Ghaziabad. He has 2 years of experience in an IT services company and worked for Apple Client. The projects include Web development and Mobile technology (Android). He is six sigma green belt certified. He graduated from Amrita school of Engineering, a deemed university from Coimbatore. He has been working on different methods and algorithms in Text Analytics. His primary areas of interest lie in Text Analytics and Web analytics.